After reading an older thread about the diesel engine getting hot (I too have this problem) while towing steep grades. I have decided to change out the Laramie grill for either the wire mesh or the honeycomb inserts or better air flow. After watching a couple youtube video's on changing the grill inserts... I have a question. In one of the videos I watched, the person did NOT reinstall the plastic side shroud air deflectors on the L & R sides of the grill. Q. Is this a good idea? Does it or would it help air flow? I will not be doing the mod on the active grill shutters as some have done. Just doing the different grill for now and see how much difference it makes. I'd like to hear some opinions before I do the swap. I switched from Big Horn grille inserts to SLT honeycomb inserts to help with engine cooling and I believe the inserts do help by 5 to 10 degrees when towing up a grade. The engineers who designed this truck added the deflectors for a reason, that being to divert air to where it's needed, I didn't think twice about not re-installing them. Keep the funnels, they'll push more air into the cooling stack and help with temps. Good idea on holding off on removing the AGS, then you'll have an idea how much each mod helped cooling. I swapped my Laramie grille out with one from a Laramie Longhorn, much better flow. I also ditched the AGS to make room for the oil cooler. phprof, TwoBobs and djr like this. Better yet would be to find a way to move the inter-cooler to a better location. I have zero clue where but that thing pumps fresh hot air straight into the lower half of the radiator. Keep the "funnels". The will help. Thanks, I guess I'll leave them on. As a side note, I really like the way Bountyhunter did the oil cooler mod, but stealership said it would void my warranty? I'll have to look more into that, but I got the 8 year plan and would hate to screw that up. lol. BountyHunter has mentioned going to his dealership for miscellaneous work and I don't recall him ever saying anything about the oil cooler voiding the warranty - and can't imagine why it would. I haven't pulled the trigger yet on the oil cooler but it's certainly on the mod list - and since I'm only 7 thousand miles away from the end of my warranty I'm not very worried about a cooler voiding it anyway. But even if I had 50K left before the end of the warranty I wouldn't hesitate to install a cooler if I wanted to. My main reason for thinking of installing an aftermarket cooler is my lack of trust in the construction of the OEM cooler rather than overheating oil - my TT isn't large enough to cause issues but the thought of the factory cooler failing and mixing oil and coolant gives me shivers. Next time you're at the dealer have the service manager give you the specific reason an aftermarket oil cooler would void the warranty. My money says he doesn't have a logical, coherent answer. Yep, at 76k of my 8/120 warranty and never an issue having my modified truck worked on under warranty. Of course Service Writers and Service Managers come in all types so you just never know until you talk to them. Haven't seen many high mielage failures on the oil coolers. I think you don't need to worry about the cooler failure now. Alot of these failures were happening before has to be a bad part or something. If you catch the leaking oil cooler in time it's not a big deal. Reason I lift my hood every few days for a minute. This is the grill I had the bodyshop install after my deer hunt lol. 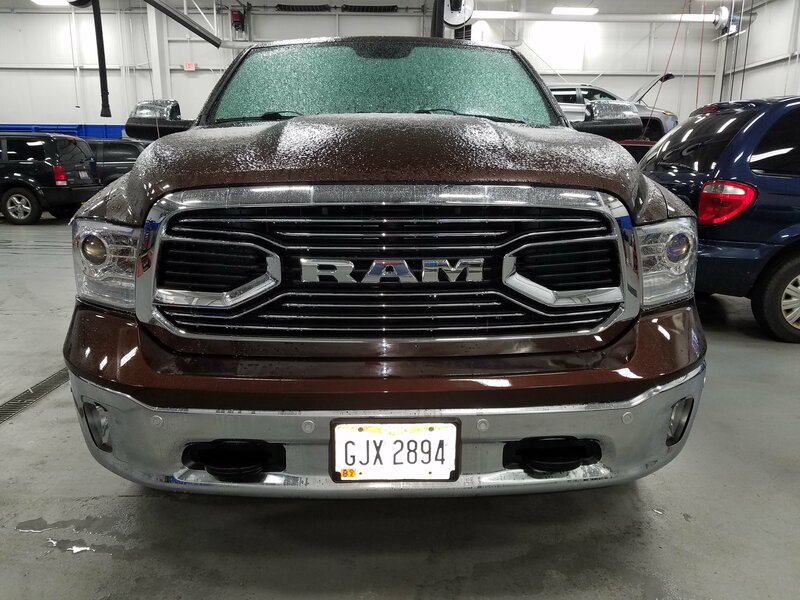 Goto post 26 https://www.ram1500diesel.com/forum/...tml#post924456 can't find the pics right now. When do you recommend changing front and rear diff fluid? changing grill inserts...who has done it? Mesh grill and active grill shutter pix?